When Jahmal Cole put out the call for ten kind people to show up, he never expected so many to respond to the request! He thought a few might turn up, but he’d be lucky if ten people really did respond. The elderly people in his neighborhood would need their walkways shoveled and Cole didn’t want them to have to worry about having to pay anyone or to try and do it themselves. 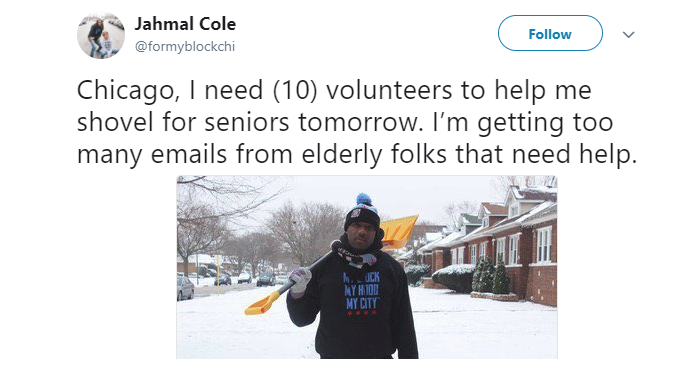 He posted a message on Twitter asking for ten volunteers to show up in one specific location in Chicago at 10:00 a.m. and said he’d provide, hoodies, hats, and lunch for anyone who did…he just had no idea how many people could make it! One hundred and twenty people arrived and they were able to quickly shovel the sidewalks of over 50 homes to elderly folks who needed the help! They flooded the area with good cheer and were determined to do as much good as they could in their spare time. The message spread far and wide. People who couldn’t make it decided to donate instead! The nonprofit community group is called My Block, My Hood, My City, and aim to do good in the community by encouraging people to get involved and helps underprivileged kids explore their own cities. Introducing them to volunteer work, the arts, culture, and programs run by the city in the hopes of bettering their own lives.